Welcome back to another 2015-16 Stampin' Up! Artisan Design Team blog hop. If you are already going through the hop, you should have just arrived here from visiting my good friend, Cindy Schuster. When you leave here you will travel on to visit the very talented Inge Groot. You will be amazed at all the fabulous projects created by the Artisan Design Team so be sure to go all the way through the blog hop! 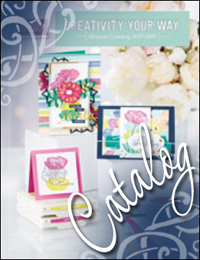 This is one of the most exciting times of the year at Stampin' Up! because it is the day that the 2016-2017 Annual Catalog goes live. Most of our projects on this blog hop will feature either a new stamp set or the new In-Colors. I decided to use the new Love & Affection photopolymer stamp along with four of the five new In-Colors. I stamped this in Basic Black Archival Ink on Shimmery White cardstock using the masking technique to overlay some of the flowers and leaves. The ink refills I used to watercolor this card are Emerald Envy, Flirty Flamingo, Sweet Sugarplum and Peekaboo Peach. (I left off Dapper Denim but you can see what that looks like in the picture below. While these colors aren't necessarily designed to go together, they do make a pretty good color combo. The greeting is also from the Love & Affection stamp set. I also created some splatters with my AquaPainter. You are going to LOVE all of the new stamp sets, so be sure to head over to my online store to get a peek. The Artisan Design Team will be hopping again in a few weeks, so be sure to check back often. Inge Groot is next on our blog hop so be sure to head on over and check out what she and the the rest of the Artisan Design Team team have in store by clicking on the button below.